Once abundant with swampy marshlands, Kailua has become one of Oahu’s gems. With beautiful white sandy beaches, modern shops and restaurants, and a lively feel, locals and tourists alike flock to Kailua town. Here are some of the things that make Kailua a favorite place to live on Oahu. The Mokulua islands, or the “Mokes” are two small islands a short distance from Lanikai Beach. The islands are bird sanctuaries and access is permitted on the beach of the larger, northern island. Once there, a panoramic view of the windward side of the island awaits and often the journey out is as rewarding as the island escape whether you canoe, kayak or take a boat out – these islands are a “must see” when travelling to the island of Oahu. Consistently rated on lists featuring the best beaches in the world, these two are nothing short of amazing. Though located adjacent to one another, these beaches are distinctly different. The more serene location, Lanikai Beach, is a relatively short span of soft, white shoreline and calm water. With most of the current protected by an outer reef as well as the Mokulua islands, the water often mimics that of a clear-blue lagoon. This beach can become crowded throughout the day – best times to get there are mornings and weekdays. 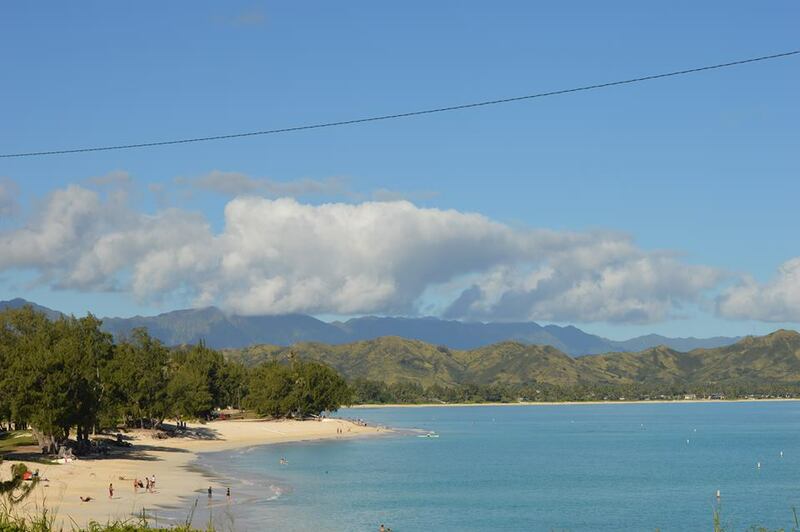 Kailua Beach is a much larger span of shoreline. At one end is the Kaneohe Marine Corps Base and nearby vacation rental of President Obama, and at the other end is a large recreational park, a boat ramp and canoe “halau” where watercraft is stored. This beach does tend to get a bit more wind funneling through than the more protected Lanikai Beach as well as choppier waters, however, this is a windsurfer’s/kite-boarder’s paradise. The long, white beaches are great for going on a brisk oceanside walk or jog and the surroundings are less crowded. Surfers and body-boarders alike enjoy the fun waves this beach has to offer. Kailua is a great place to rent a kayak (or just a snorkel). With local shops just steps away from the beach, such as Kailua Sailboards & Kayaks www.kailuasailboards.com one can easily rent all the gear necessary to head into the water and paddle out. One of my favorite spots is a little island, Popoia, commonly known as “flat island” where I often encounter green sea turtles swimming nearby. This island is a State Seabird Sanctuary as well - housing the wedge-tailed shearwater seabirds. Original home of notorious windsurfing legends like Robby Naish, this beach is an excellent launching pad for wind-related water sports. Hop on a windsurfboard, kiteboard, or hobie cat and quickly escape the bustling beaches. A quaint steakhouse located at the entrance to Lanikai, Buzz’s is the go-to place for steak and seafood lovers. A perfect evening spot to enjoy a cocktail and dinner on the lanai. Famous for their potent Mai Tais – grab any of their tropical drinks and relax at this heavenly beachside restaurant. After a long, fun-filled day at the beach, there are few things greater than a refreshing, tasty snow cone, or “shave ice” to cool you down. Known for a variety of tropical flavors – this spot is a winner. Experiment with some of their more adventurous flavors such as li hing mui with azuki beans. As the locals say “So ono”! Don’t have a suit to wear? Head over to 629 Kailua Road (near Whole Foods) and check out their stylish suits, clothing and hats – perfect combination for hitting the beach in fashion. One of my favorite spots in the heart of Kailua for a great cup of coffee and a delicious meal. This spot will have something for everyone – Keiki Pancakes for the kids, to more unique dishes like Prosciutto, Eggs & Cheese, to healthier choices like Vegan Waffles. Kailua has several golf courses with various levels of difficulty. Pali Golf Course, at the base of the Pali is lush and green. This course is fun, gorgeous, not too difficult and relatively inexpensive – yet can be quite rainy. Olomana Golf Links features a course of above-average difficulty and offers a full range of services with comparatively low fees. Mid-Pac Country Club is a private course tucked on the mountainside of Lanikai. This is an absolutely gorgeous course with a clubhouse overlooking amazing views from the ocean to the majestic Pali mountain range. If you are able to accompany a club member at this course you will love it! Lanikai Pillboxes offers amazing, panoramic 360 degree views of the windward coast and a short trail to the top bunkers. Kailua town has a genuine community and outdoorsy feel where people often spend their days outside, strolling the beach, riding their bikes and dining out. You can search properties in this area at www.ZaneProperties.com and consult with a Kailua expert to set up appointments to view. Everyone’s buzzing about this generation of home buyers! The real estate world has been waiting for the millennial generation, which will pass the baby boomer generation as the largest home buying group this year, to start purchasing homes. Due to the recession and incredibly high amounts of student debt, millennials have been holding off on starting families and buying houses. Not that one is required for the other, but the trend tends to work together, as the past several years have seen an increased number of single millennial renters instead of home purchasing families. However, a report by Bloomberg revealed that the continuous rise in the cost of renting is pushing millennials, single or not, into the real estate market. Stats show the millennial generation has been increasingly demonstrating their homebuying interest. Last year, millennials made up 32 percent of the housing market, a 28 percent increase from 2012. Though this increase is happening slower than many real estate professionals would like, this year could see a big change, with about 5.2 million renters expressing interest to buy, Bloomberg reported, citing Zillow Housing Confidence Index data. Not so fast...Though this change is a positive one for the housing market, most of these buyers are first-timers, which means there is great potential for human error. When it comes to purchasing a new home, or any piece of real estate, there are common mistakes that can be easily avoided, yet most millennials might not be aware of them. Two-thirds of millennials aren't aware of closing costs when they purchase their first home, according to a survey conducted by the ClosingCorp of San Diego, the Central Valley Business Times reported. Closing costs are paid at the close of a real estate transaction. They are typically 2 to 5 percent of the total purchase cost. "This study is very interesting in that it shows millennials are more dependent on Realtors than previously presumed," said Brian Benson, CEO of ClosingCorp. "We know they are more tech-savvy than their predecessors, so we believe this really highlights the complexity of a residential real estate transaction." If you are unsure about how to go about preparing for closing costs, speak with your escrow agent. It's best to have that money set aside so you are prepared for the day you close on the house. The economy is in a good place and continuously getting better, as employment increases, gas prices are low and consumer confidence is high, but that doesn't mean you should put all of your savings into a down payment. According to Danielle Kubes in a special report for the Financial Post, millennials have a bad habit of putting too much into a down payment in an attempt to get ahead of the game. This is not a smart idea, as it doesn't allow you to prepare for emergencies that could arise. Just because things are going well right now doesn't mean catastrophes or life changes don't come up. Embrace the Boy Scout motto and Be Prepared! Millennials typically resort to Web or mobile-based methods of searching for a house, and don't put enough faith in using a real estate agent. According to Khani & Auerback Law Offices, having an agent in your corner will work to your advantage in everything aspect, from being more cost-aware to having successful negotiations. Either check reviews online, or get referrals from friends and family members. Either way, if you are purchasing a home for the first time, don't do it alone. Though you might think you can have a successful experience relying solely on an app service or simply doing your own research, this is not the case. Let a professional work on your behalf so you can get everything you want in terms of location, price and overall convenience in the process. Real estate agents do this for a living and will be able to show you how it's done. You will also be more confident as you go through the process, knowing you have a professional's experience on your side. Work with an agent so you don't miss any details. As the tide shifts in the housing market and more millennials start making home purchases for the first time, there are going to be many mistakes along the way. However, the millennial generation typically does more research and asks more questions than previous generations, mostly due the fact that they are utilizing technology more often and seeking information all the time. If you are a millennial and switching from renting to buying this year, pay attention to the mistakes listed here, but also seek out a real estate agent and work together. It is important to note that as more millennials step into the market, it is going to become increasingly competitive. Don't compete on your own! The housing market, after seeing some tough years, is on the up and up. While some of it has to do with millennials becoming a large force of first-time home-buyers as they climb the corporate ladder and pay off student loan debt, much of it also has to do with rising costs of rent. Renting became an incredibly popular choice during the economic recession because it kept people free from financial commitments, especially those too timid to secure a home investment when factors such as jobs and salaries were uncertain. However, as the popularity of renting continued to increase, so did rent prices. And now, as the economy finds itself in a better position, with consumer and investor confidence up and employers hiring again, renters are finding that investing in a home is a better option for their wallets and their futures. According to a report by RealtyTrac, in 76 percent of U.S. counties monthly mortgage payments are cheaper than rent, as noted by HousingWire. The report included 461 counties across the U.S.
"From a purely affordability standpoint, renters who have saved enough to make a 10 percent down payment are better off buying on the majority of markets across the country," said Daren Blomquist, vice president of RealtyTrac. "But factors other than affordability are keeping many renters from becoming buyers, a reality that means real estate investors buying residential properties as rentals still have the opportunity to make strong returns in many markets across the country." It's like paying yourself: When you pay your monthly rent, you are paying it to a landlord. While this secures your living space every month, this is money you will never see again. This is not the same when it comes to purchasing a home, in which you take out a mortgage and pay it down. Though it doesn't happen overnight, Total Mortgage noted the biggest benefit to your monthly mortgage payments is the fact that the mortgage continues to get smaller, allowing you to eventually pay it off. Rent is not something you can eliminate or pay off. In fact, it is only customary for rents to increase, as has been the trend. Mortgages, on the other hand, can be wiped away and leave you as the sole owner of the house. Fewer restrictions: When you buy a home, you have freedom in everything from pets to renovations. Renting comes with many restrictions, causing you to search a bit harder to find what suits your needs. When it comes to purchasing a home, Mortgage Calculator noted you have the ability to improve your investment. If you purchase a house and end up remodeling a great deal of it, you can increase the value over time. This is not true when renting a place, in which you have no control over the renovations or financial improvements. Similarly, even if you did, the property is not yours to see a return on. But if you own a home, then those improvements and increased value will come back to you in the end. Tax deductions: Mortgage interest and private mortgage insurance can be written off when it comes time to file your taxes. This is a nice little bonus when tax season comes around, because by reducing your taxable income, you can lower the amount you owe in federal taxes, or you could see an increase in your refund. Either way, you are able to deduct more when owning than you can when renting. If you are a renter and spending more than you want, but have a steady income and plan on being in the same place for the next five to seven years, then maybe purchasing a home is a better option for you. If you think purchasing might be the right choice for you, be sure to take a look at your budget, and speak with both a real estate agent and an escrow agent to find out how to make the purchasing process as simple as possible. Make sure you have professionals in your corner before embarking on a shopping trip of this magnitude! When you're getting ready to sell your home, you want to make sure you take all the right steps so you can get it sold fast and for top dollar. Of course, unless you're a professional Realtor, chances are you're going into the whole situation a bit blind. From the best colors to paint your living room to whether the new owner needs title insurance, no one expects you to know everything about selling real estate. For that reason, many people make common errors when selling their home and it can really muck up the process. Don’t be one of those people! We know. It's the age of do it yourself. You've got the Internet at your fingertips, so you can do just about anything without having to consult an expert and save yourself a few bucks while you're at it, right? Not in this case. While you may have successfully figured out how to change out your kitchen faucet, this is a whole different animal. A licensed Realtor will bring education, experience and a practiced eye for getting your home sold quickly. You've lived in your home for years, so it may be hard for you to be objective about the space - a Realtor can provide a much-needed outside perspective as well. If the sliding back door has always been slightly off its runner for years, you may have just learned to live with it and hardly even notice it anymore. And while it may not be a deal breaker, enough small issues with a home may lead would-be homebuyers to think that you've not been keeping up with major repairs like the roof or the electrical system, which can be a deal breaker. Before you show the house, get around to replacing that cracked mirror or the cabinet door that won't quite close. Even if the interior of your home is immaculate, if you've let your front lawn go weeks without a mowing or have a dead tree in your front yard that you've failed to remove, it can give a terrible first impression of your home - one that may be hard for homebuyers to ignore. Try not to think of your yard as a separate entity from your home. Rather, it should be an extension of it - as much a part of the house as the living room or kitchen. So make sure it looks awesome! Sure, you're still living in your home, and homeowners know that. But that's no excuse for leaving dirty dishes in the sink, your bed unmade or your kids' toys lying around the house. It's not easy to keep your home showroom ready day in and day out, but the extra effort will be worth it when your home sells more quickly. It's impossible to live and raise your family in a home, and not leave your personal mark on the place. But when a couple is looking for a house to bring up their own kids, they need to be able to envision their own family making a home there. When you're going to show your house, take your kids' drawings off the fridge and try to clear out as many personal effects as you can. Present as much of a blank canvas as you can, and the homebuyers will more easily see the potential. Any pet owner knows their four-legged friends are as much a part of the family as any of their two-legged family members, but sometimes Fido has to go. This is true for a few reasons. First of all, pets are often distracting. During an open house, there are dozens of people walking in and out, and animals often want to greet them all - or, worse, defend their territory. Plus, many people may be allergic or afraid of pets of all shapes and sizes, and the last thing you want is for a potential buyer to have to make an early exit because they are uncomfortable. When you're getting ready to show the house, ask a neighbor or friend to watch Fluffy or Spot for a few hours, or take them to a local daycare for some fun. No one knows your house better than you do, so it makes perfect sense that you should be there to let homeowners know the ins and outs of your house. You have information about the school district, the neighbors and nearby parks. But the fact of the matter is, you're probably doing more harm than good. Just as you want to remove the massive collage of your family that's hanging on the wall, you may want to remove yourself from the premises as well and let your Realtor do their job. Avoid these top seller mistakes and help people see the beauty of your home! If you are getting ready to move, you are probably currently sitting in your living room surrounded by a billion empty cardboard boxes. Maybe you're feeling overwhelmed. Maybe you're crying. Probably not, but hey, we don't know you. It seems logical to take all of your clothes off their hangers, fold or roll them up, pack them into boxes, move them, unfold them and hang them back up in the new closet, right? But that takes approximately 87 steps, so let's shorten up the process. Instead, leave your clothes on hangers, bundle them together in small groups with tape or a zip tie, and cover them with a trash bag. It will save a ton of time. On your first night in your new house, do you really want to have to dig through four different boxes to find your toothbrush? No, you don't. Before you get too carried away with packing, make sure you pull a few items aside and bring an overnight bag with enough essentials to last you a night or two in your new home. Just like taking clothes off hangers when they're just going to go right back on doesn't make sense, why would you empty out drawers that are going to have the same stuff in them in the new house? Just pull the drawers all the way out of the dresser and wrap them in cling wrap for the move. And we mean everything. Every single box should be labeled with its contents as well as the room where you plan on keeping them. Don't be afraid to get into detail, either. Instead of two boxes labeled "shirts," mark one "t-shirts, tank tops and long-sleeved tees" and the other "button downs, sweatshirts and sweaters." It will be much easier to find what you need later. But that was a trick question, because your clothes should be on hangers, not in boxes! Instead of packing one box full of your towels and bed sheets, put them to use. You can use them in lieu of bubble wrap or newspapers to keep delicate items from breaking. Cheers to your new home!